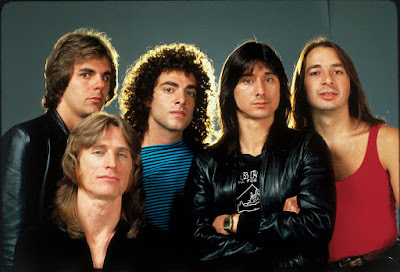 Journey guitarist Neal Schon is hoping Steve Perry will reunite with the band for a performance at their induction into the 2017 Rock And Roll Hall of Fame next April. The group were named Tuesday as the latest honorees alongside Pearl Jam, Yes, Electric Light Orchestra, Joan Baez and Tupac Shakur. The classic Perry lineup of Journey – Schon, Jonathan Cain, Steve Smith, Aynsley Dunbar and Ross Valory – will enter the 2017 Rock Hall alongside founding keyboardist/singer Gregg Rolie. Journey had their most successful commercial period with Perry, who joined the group in 1977; a string of multi-platinum albums followed before his departure in 1998. The last time the singer performed with his former band was at a tribute show for legendary concert promoter Bill Graham following his passing in 1991. As for Perry, he released a statement regarding the news, saying "I'm truly grateful that Journey is being inducted into the Rock and Roll Hall of Fame." Following Perry’s split from Journey in 1998, the band brought in Steve Augeri, followed by Jeff Scott Soto in 2006 and, in 2007, Filipino YouTube discovery (and Perry sound-alike) Arnel Pineda, who helped revitalize the band while their 1981 smash, “Don’t Stop Believin'”, emerged as one of the biggest selling songs of the new digital era. Perry made his first return to the live stage in 18 years in 2014, appearing at a Guitar Center Hollywood Rock Walk induction for friend and drummer Steve Ferrone before teaming up with alternative band EELS for some Journey classics in St. Paul Minnesota, Washington, DC and Los Angeles. He also joined fans at AT&T Park in San Francisco for a sing-along of “Don’t Stop Believin’” during game 3 of the National League Divisional Series between the San Francisco Giants and the Washington Nationals. Last December, Perry revealed that he was in the studio working on his first solo album in more than 20 years.